Air Costa, India’s first regional jet airline, turns 2 tomorrow (15th October 2015). The airline, which is the second airline in India after the now defunct Paramount Airways to operate the Embraer E170s, is terminating lease on the aircraft, making Air Costa perhaps the last Indian operator to employ the 70-80 seat regional jet. The airline’s two Embraer E170s, registered VT-LSR & VT-LNR, were the first two airplanes for the airline, leased from Embraer’s ECC leasing. The aircraft earlier flew for Gulf Air, which had fitted the cabin with 67 seats : 7 business and 60 economy. The aircraft can pack in a maximum of 78 seats in a single class configuration. The airline has cancelled up to 4 flights owing to one of the two E170s (VT-LSR) being returned in November. As of today, out of the 32 daily flights the airline used to operate to 9 destinations, it presently operates 25-26 flights. This is further expected to go down to around 15 – 16 flights per day in the next 10 days. When two new Embraer E190s are inducted, the airline will resume the flights previously operated by the E170s starting 1st Dec 2015. Due to this, Air Costa does not seem to sell for, and operate certain E170 sectors between 25th Oct and 30th Nov (as per the website), till these are operated by the replacement aircraft, an Embraer E190, 1st Dec onwards. These sectors are captured in the table on the left. 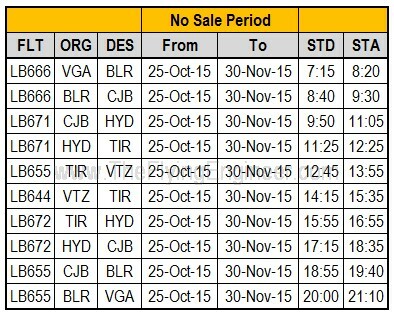 The airline has opened sales for these sectors for travel December 1st onward. Frequencies on routes such as Bengaluru<>Vijayawada has halved. Air Costa’s two other aircraft – Embraer E190s registered VT-LBR & VT-LVR, leased from GECAS, shall remain in the fleet, one of which would be going for a scheduled maintenance in mid-November. The Embraer E190 is a money maker for the airline, and Air Costa is using the asset to its strength. The 2 E170s will be replaced with 2 E190s in the next 3 months. Based on studies by The Flying Engineer, small capacity regional jets of less than 100 seats have limited relevance in the Indian market, today. A great way to capture the market is to complement the Airbus A320 / Boeing 737s (180 seat airplanes) with an aircraft of nearly 50% – 60% capacity, making the Embraer E190 with 114 seats (maximum) an ideal airplane for routes with insufficient demand for a 180 seat airplane. Air Costa will be able to connect Tier II and Tier III cities across the country with any Tier I city once its air operator permit (AOP) is converted from a scheduled southern regional airline to a scheduled (pan-India) airline operator permit. This change of AOP is expected to happen soon. However, the airline’s network will continue to be focused on the regional segment, but at a pan-India level. With the airline demerging from other projects of the parent company, Air Costa is ready to attract external investments into the airline. It plans to induct 4 aircraft every year, from 2016. By 2018, the airline plans to have a minimum fleet of 12 aircraft and fly to 18 stations. Air Costa presently operates to 9 destinations. A major network change is expected in light of the change in fleet. Bhubaneswar, Pune, Guwahati, Indore, Patna and Bhopal are expected to be added to the network when the fleet size touches 8.